So this past weekend AL and I had our work cut out for us. We had the "San Dimas Family Fitness day" and our Mountain Bike event at Bonelli Park. So I was asked if I would like to bring out a health booth of course I said yes as SC VELO bike club was already involved with the bike portion of the festival. 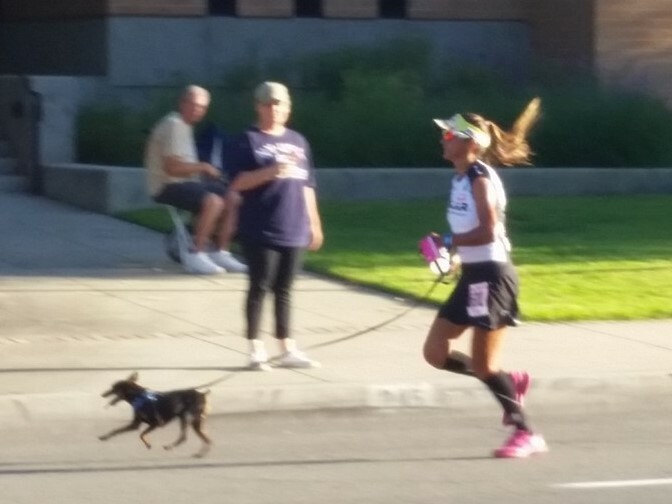 I was up early and by 7am even had a race number for the 5km event that would take place at 7.30am, I was running with Hammer my min pin. I warmed up getting Hammer to go to the bathroom. Al was on his mountain bike the gun went off Hammer my min pin took off! His ears flying his bark was excited and our first mile was a 6min 40 second!! Phew two more miles to go the sun was coming out and Hammer needed water I gave him a drink out of my hand held fuel belt, then he stopped to smell a fire hydrant at mile 2 were a group of awesome cheer girls Hammer always stops to be hugged petted and of course a cup of cold water. Out last mile we had to play catch up and we made it to the finish in 22mins and 7 seconds !! We took 3rd Female overall and 1st in my age group and first in four paw age group and 19th over all! Not a bad run at all!! Then we worked at the Polar Booth and gave a beautiful FT4 away to the awesome little female runner the grand age of 9 years old!! !